The Victor Constant Ski Area was dedicated in 1946 in memory of Capt. S. Victor Constant, Dept of MA&E, who as coach of skiing, designed and supervised construction of these slopes and tows and by his skill and leadership, developed recreational and competitive skiing into major activities at the Military Academy. Children 13 and younger must be accompanied by an adult. Sledding and Tubing on the ski hill (including the bunny hill area) is prohibited at all times. Trespassing is prohibited after hours during snow-making. Download our 2019 Brochure for prices, directions, and general information. X-Country Skiing and Snowshoeing coming soon! Located on designated tracks on the West Point Golf Course. For equipment rental and additional information, please call (845) 938-8810. Getting ready to hit the slopes. A perfect day for Snowboarding! Justine Meberg "First Chair Lift" of the Season. Declan Squire "First Bunny Run" of the Season. ACTIVE DUTY & IMMEDIATE FAMILY: 3 December 2018 at 9a.m.- 5p.m. ALL OTHER ELIGIBLE PATRON: 4 December 2018 at 9a.m. - 5p.m. GENERAL PUBLIC: 17 December 2018 at 9a.m. - 5p.m. The only way to secure a multi-week lesson is through Webtrac or in person at Victor Constant Ski Area. SKI: This lesson is designed for various levels of skiing ability, from the entry level skier, to the skier who wants to improve their technique and knowledge. Students will be evaluated by the instructors to determine skills and will be placed in groups according to ability and age. A new skier can expect to become familiar with the equipment, balance, agility, edges and stopping.Skiers who have progressed will work on: change of direction, linked turns, match the skis, maneuver over varied terrain, and ride the chairlift. All skiers will be coached to improve their skills and progress to their next steps. SNOWBOARD: This lesson is designed for various levels of snowboarding ability, from the entry level rider, to the rider who wants to improve their technique and knowledge. Students will be evaluated by the instructors to determine skills and will be placed in groups according to ability and age.A new rider can expect to become familiar with the equipment, balance, agility, edges and stopping. Riders who have progressed will work on: change of direction, linked turns, maneuver over varied terrain, and ride the chairlift. NOTE: Student's progression varies.Students may move at any time during the 4-week period to different classes depending on individual and/or group's progression. For whatever the skill level it is you achieve during these lessons, we can assure you that you will have fun! This lesson is designed for the beginner rider/skier. Students will be evaluated by the instructor(s) to determine skill level and will be placed in groups accordingly. A new rider/skier can expect to become familiar with the equipment, balance, agility, edges and stopping. Riders/skiers who have progressed will work on change of direction, linked turns, maneuver over varied terrain, ride the chairlift. This lesson is designed for various levels of skiing ability, from the entry level skier, to the skier who wants to improve their technique and knowledge. Students will be evaluated by the instructors to determine skills and will be placed in groups according to ability and age. A new skier can expect to become familiar with the equipment, balance, agility, edges and stopping. Skiers who have progressed will work on: change of direction, linked turns, match the skis, maneuver over varied terrain, and ride the chairlift. All skiers will be coached to improve their skills and progress to their next steps. NOTE: Student’s progression varies. This lesson is designed for various levels of snowboarding ability, from the entry level rider, to the rider who wants to improve their technique and knowledge. Students will be evaluated by the instructors to determine skills and will be placed in groups according to ability and age. A new rider can expect to become familiar with the equipment, balance, agility, edges and stopping. Riders who have progressed will work on change of direction, linked turns, maneuver over varied terrain, ride the chairlift. NOTE: Student’s progression varies. We introduce children to skiing with a blend of on-mountain instructions and of course fun! Lessons are taught at the base of our beginning area and only progress to bigger slops/terrain when ready. We will be learning sliding, stopping, turning, along with rules of a responsible skier to help foster an appreciation for skiing and the outdoors. Children MUST be able to take care of their own personal needs (potty trained). This program is designed for children new to the sport and not yet able to use a chair lift. Please remember, the size of the group is based on skill ability, maturity, and age of students. All of Victor Constant instructors are 100% volunteers. We try to keep the same instructor(s) with the group for the entire session but please be aware that there can be substitution during the 4-week period for Plebes, and 5-week period for Ski Wee. *Must be sponsored by an Authorized User. Season Passes On Sale Now Click Here! ON-SITE RENTALS: Call ahead and we will have your equipment waiting for you. No more storing, loading, unloading, carrying, your equipment to and from West Point. We will size you to the correct equipment at the beginning of the season. Please call for your pick-up (845) 938-6013. Our tech shop offers ski and snowboard tune-ups along with minor equipment repairs during normal operating hours. Same day and next day services available. Tech shop only works on 2017-18 indemnified bindings. If you are not sure, speak to a technician. Drop off/pick up next day service is preferred. There are 120 seasonal lockers on the lower floor of the Class of ’48 Ski Lodge available for rental annually for occupancy by eligible patrons. Seasonal lockers are capable of holding two (2) sets of skis, boots and poles, or four (4) pairs of skis. Occupants are selected first come basis starting the day of the Ski and Snowboard Sale (December 1, 2018). Victor Constant Ski Area closes in mid-March. Equipment and locks must be removed from seasonal locker by 1 April. Access to Ski Lodge is not permitted after this date as Victor Constant Ski Area will be closed and inaccessible. Items left behind are assumed property of the Victor Constant Ski Area and may be disposed of as such. a. Those wishing to rent a seasonal ski locker must report to the ticket office for payment of locker(s). Upon payment, customer will be issued a locker and it is the responsibility of the customer to use their own lock. b. If all lockers are claimed, a waiting list will be started. 100% of the seasonal locker fee must be paid at the time of the locker request. Failure to satisfy payment deadlines will result in forfeiture of reservation. Subletting or selling of seasonal locker privileges is prohibited. Group outings are welcome at Victor Constant Ski Area! Its great way to reconnect with friends, family and co-workers. Fill out the form below and one of our dedicated staff members will contact you with more information. Once your outing is confirmed an equipment rental & liability form will be sent to the event POC. All person(s) in the outing must fill out the form and all forms shall be submitted 72hrs before the event to allow our team to coordinate all the requested equipment needed for an enjoyable experience at Victor Constant. Once a customer preselects equipment and chooses a discipline (ski/snowboard) they must stay with that discipline throughout the visit. Group assumes full responsibility for passes ordered and agrees to make final accounting of all monies the day of visit. Changes in weather and snow conditions are part of the skiing experience, and learning how to handle such differences is part of learning how to ski well. Area management reserves the right to make decisions concerning cancellations and hill closures due to weather & safety. There is NO refund for Daily Snow Passes. Rain checks may be authorized by Ski Area Management for premature closure due to weather or equipment failure only. Resale of passes is unlawful and subject to prosecution. Participants will be ticketed upon arrival at Victor Constant. Group leader is responsible for distributing all passes. If additional passes are needed on the day of your visit, you MUST present a copy of this contract to the Group Services Center to receive the applicable group rate. Victor Constant reserves the right to limit/close operations of any part of the facility for capacity limitations, safety and operating reasons, including inclement weather. Victor Constant’s operating season is scheduled from mid-December thru mid-March (weather permitting). Hours of operation are subject to change without notice. Participants should understand that trail and slope conditions vary due to weather changes and skier use. Ice, variation in terrain, forest growth, rocks, debris, lift tower and other obstacles and hazards may exist throughout the ski area. Using lifts can be hazardous. I accept that it is our responsibility to ask for help from attendants if we are unfamiliar or uncomfortable with safe lift riding. I and/or the minor I represent, act at our own peril with respect to above. Division IAW the established SOP. The Victor Constant Ski Area Manager is delegated direct responsibility for maintenance, scheduling and supervision of the ’48 Lodge, to include all aspects of this SOP. b. The Class of ’48/98 Lodge is available annually, for official functions and social gatherings, throughout the ski season. c. The Class of ’48/98 Lodge consists of two large rooms with snack bar area. Facility has a carpeted floor on the main floor and rubber tiles on the lower floor; cathedral ceilings, solid oak tables and chairs, wrap around deck, and 110 V electric outlets. Both of the fireplaces are off limits as well as the grill and refrigerators. a. Reservations for the Ski Lodge are accepted thru the West Point Golf Course for dates 1 Apr – 31 Oct and thru the Ski Area Manager for dates 1 Nov - 31 Mar. b. Reservations made thru the Ski Area are accepted first come first serve bases. Reservations for the entire lodge are available Saturdays from 8 -11 p.m. and Sundays from 6 - 9 p.m. Call the Victor Constant Ski Are for available dates. c. All reservations require a 50% deposit to be paid at the time of the reservation with the balance due within two (2) weeks prior to reserved date, based on established/approved fees. Payment is accepted by check, cash, Visa, Master Card and Discover. Cancellations received two (2) weeks in advance of the starting time of the reservation, will qualify for a full refund, minus a $5 processing fee. Cancellations received less than two (2) weeks will be subject to forfeiture of entire rental fee. Exceptions will be considered on a case-by-case basis by the Ski Area Manager. MWR Recreation Division (RD) cannot guarantee availability of resources to operate the Ski Area throughout the entire ski season. The ski season may be curtailed at any time for various resource shortages. Official ski season is from 26 December to early March. 1. Refunds may be requested through and approved by the Chief, RD only. Refunds take a minimum of 2-3 weeks for processing thru NAF financial services; subject to a $5.00 processing fee. 2. Refunds for Season Passes may be requested for PCS, TDY (un-programmed or extended), and Medical reasons only. Refunds are prorated as follows: 100% Prior to opening day, 66% prior to 15 January, 33% prior to 15 February, 0% (no refund) after 15 February. 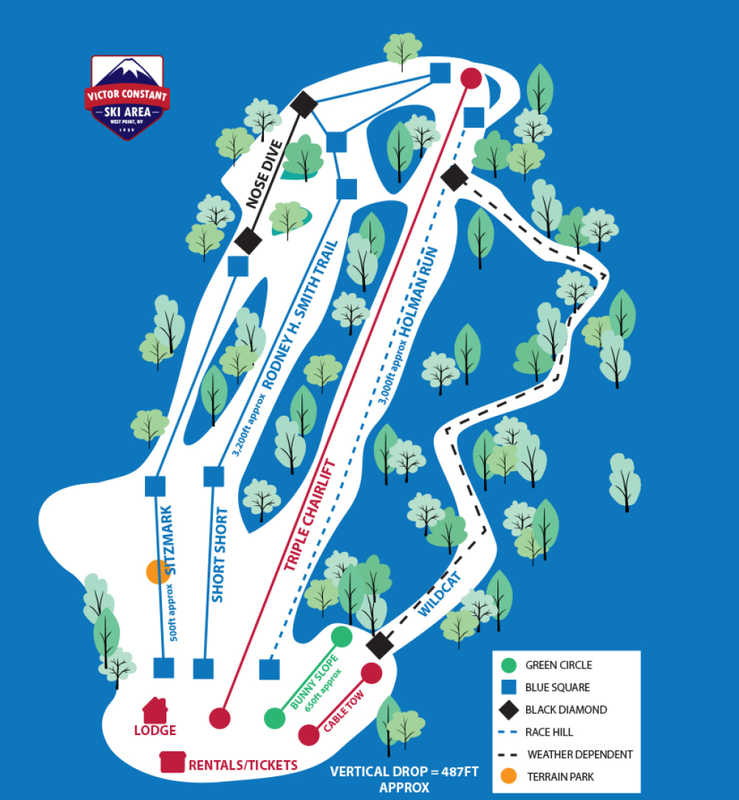 Forms are available at the Ski Area Sales and Ticket Office. Refunds are calculated from the date received except for medical reasons which will be determined from a dated Physician's note. *No refunds will be given due to weather or lack of usage of Season Pass, Victor Constant Ski Area does not assume responsibility for amount of pass usage (no set number of visits is guaranteed). 3. There is NO refund for Daily Snow Passes. Rain checks may be authorized by Ski Area Management for premature closure due to weather or equipment failure only. 4. Refunds for Lessons must be received prior to program commencement. NO refunds prorated or otherwise, will be considered once a session/lesson has begun. 1. Season passes are non-transferable. Reselling or allowing another person to use the pass constitutes theft of services. The Season Pass will be revoked and the action dealt with by MWR management. 2. I agree and understand that my season pass may be canceled without refund, if abuse my privileges by acts that endanger my life or others, or violate the N.Y.S. Code Rule 54, Article 18, "SAFETY IN SKIING CODE" & "NSAA Your Responsibility Code." 1. No snow toys allowed (sleds, toboggans, toy skis and snowboards without metal edges) allowed at any time. 2. Victor Constant will not be responsible for any stolen or damaged property. Unfortunately items can be stolen if left unattended, we suggest to all of our customers to lock up skis and boards. If something does get taken or damaged we always recommend that you file a complaint with the Military Police (845) 938-3333. 3. Our lift requires routine maintenance. We will not be responsible for grease damage to any outwear due to grease dripping from lift. This is an inherent risk of the sport. 4. We ask that all snowboarders use a leash with their snowboard. We will be spot checking for leashes on lift lines. If you forget your leash, we have them available at our retail store for $6. 5. While we recommend lessons through our ski school, parents are welcome to teach their children but both parent and child must have a valid snow pass and equipment while on the snow. We are looking out for your protection. 6. We ask that parents stay off the snow and behind fencing while watching their child's lesson. 7. As per Army regulation 215-1, chapter 8, section II, 8-24, line 17 - No member, guest or group will be permitted to bring food or beverage into a MWR FB&E facility for consumption on the premises. If you bring your own food you can eat it on the outside deck portion of the lodge area. If you are seen eating outside food inside the lodge, you may be asked to move outside during this time.